This looks like hard work to me. Lynne: Loryn and Kristin have already written about the great Saturday we had garage saleing together, so I thought I would add some comments to theirs. It is unusual that we are all together and still have enough time to spend on a morning of garage sales. It’s really an immense amount of fun, although we have to account for the space two more people occupy and buy accordingly. 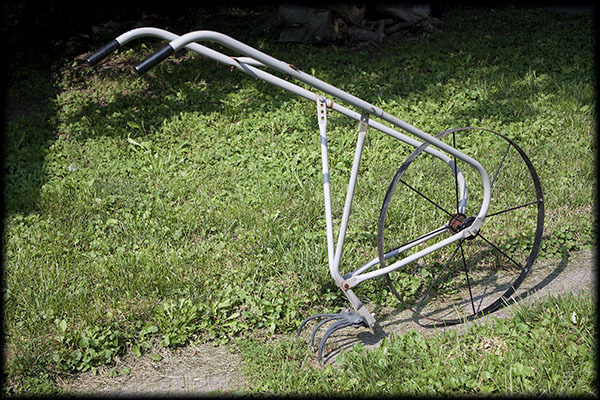 I have been looking for the past two years for a harrow for my brother. I have sent him endless photos on my cell phone of seeders and harrows and other things with interesting parts but no specific name. All of which were busts. Cheri and I were talking Saturday morning about some of the finds we had made and I mentioned that Bob’s harrow was being extremely elusive. I told her that I may have to give up that find. One garage sale later, I stared in disbelief at a harrow. I know that it is probably coincidence, but it is not hard to believe that some spirit of garage sales has aligned my wants with the items in a sale. That was my find of the week and is another notch in our tally book of garage sales. Good hunting out there and may all your notches be as satisfying. That was the best sale of the day. Woot for good garage sales!